Greg Opatik has a degree in design from Kendall College of Art and Design. He has been creating and developing modern furniture of both his own composition and those of others for more than fifteen years. Playing the guitar since childhood, Sinuous guitars are a culmination of his design and manufacturing background blended with his own guitar playing experiences. 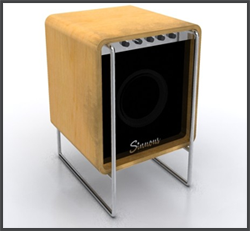 Sinuous is currently developing a guitar amp that will match the finish of our guitars and look good in any room of the house. You can literally rock out on this amp by plugging in and having a seat on top of the amp.